Growing seedlings of tomatoes in open field for late production in Bulgaria is a process which depend of climatic conditions, especially from temperature. Dry and hot weather is a precondition for death of young plants. That’s the reason to looking for alternative methods for growing seedlings. To obtain good quality of seedlings in recent years some experiments were conducted in foam trays with different size of cells and enrichment of substrate mixture with organic fertilizers with broccoli and tomatoes [1, 2, 3, 4]. These results indicate the need to study optimum dosage levels for vermicompost and system of growing, with the aim to providing quality of tomatoes seedlings in open field. Material and methods. The experiments were carried out with tomato seedlings, cv. Nikolina F1, in Maritsa VCRI, Plovdiv, Bulgaria, during period 2014-2015 years. Two systems of growing seedlings were used: traditional seed bed and modified floating system. Traditional seed bed: seeds were sown in bed in soil, scattered, with food area of one plant about 11,56 cm2. Substrate mixture of peat moss and perlite 3:1(v/v), enriched with vermicompost according to variants was used to cover seeds. Modified floating system: seeds were sown in foam trays filled with mixture of peat moss and perlite 7:3 (v/v), enriched with vermicompost according to variants. The trays were 33 x 53 cm, with 70 cells (3,4 х 3,4 cm; 11,56 cm2 food area of one plant). Foam trays are situated in water beds (10 L water in 2 m2 per day). In both systems seeds were sown on June1. The experiment was conducted in 3 repetitions with 10 plants. The experiment finished 25 days after sowing. Soil samples from the top layer (0-15 cm depth), substrate mixtures and vermicompost were analyzed before sowing of seeds (Table 1). Chemical analyses of substrate mixtures/soil for period 2014 — 2015. Vermicompost is organic material resulting from nutrition of California red worms (Lumbricus rubellus) with caw manure. Vermicompost was added in mixture in the time of preparing of substrate. Contents of available elements (N, P, K, Ca and Mg) are presented in Table 2. Analyses of substrate mixtures/vermicompos are made by method of Sonneveld et al. and of soil by method of Gorbanov et al. . Temperature conditions during period of growing seedlings, for 2014 and 2015 year are presented in Picture 1. Treatments (variants): Control 1 — without fertilizers (C 1); Control 2 – recommended fertilizers (triple superphosphate — 1200 kg/m3, ammonium nitrate-500g/m3, potassium sulphate 500 g/m3 and magnesium sulphate — 200g /m3) (C 2); Vermicompost 25% of substrate mixture (V 25%); Vermicompost 50 % of substrate mixture (V 50%); Vermicompost 75% of substrate mixture (V 75%). Measurements of seedlings: Root length, cm; root fresh weight, g; plant height, cm; stem fresh weight, g; diameter of stem, mm; leaves number per plant; leaves fresh weight, g; total plant fresh weight, g.
Statistical analysis: Data were subjected to Duncan’s Multiple Range Test to separate means. Results and discussion. Enrichment of substrate mixture with 25% vermicompost has positive effect on the length of roots (Table 3). Differences between variants in seed bed are negligible and statistically unproven. This is due to breakage of the root system of the plants at plucking before planting and is a significant disadvantage in this technology of growing seedlings. The differences in this indicator in the modified floating system are small but statistically proven. Increasing content of vermicompost of mixture in foam cells has a negative impact. Similar effect was observed on the root weight. Indicators of the root system are more influenced by the system of growing seedlings. This factor is more expressed on the root weight. Cultivation of plants in trays maintaining the integrity of the root system but its capacity is limited by the size of the cells. Seedlings grown in trays have preserved structure of the root system, which positively affected the subsequent rooting and development of plants after planting on the field. Quantity of vermicompost affects positively on the parameters of the stem (Table 4). Increasing the amount of vermicompost improve height from 17,63 cm (V25%) to 18,66 cm (V 75%) of the plants in traditional seed bed. In modified floating system is observed the opposite effect and reduction of plant height from 4,94 cm to 3,39 cm. Higher fertilization rates of 50 and 75% have a positive impact on the diameter of stem of plants from seed bed. The low level of 25% has the best effect on this indicator for plants from floating system. Increasing the content of vermicompost of mixture has a negative impact on the plants. A similar effect was observed by Tringovska and Dintcheva  on tomatoes transplants. Effect of vermicompost is less pronounced than the effects of mineral fertilizers, independently of the cultivation. System of seedlings growing influenced habit of tomato plants. Plants from traditional seed bed have a strong habit than plants grown in modified floating system. This is probably due to the greater mass of the root system and the ability to utilize a more nutrients from the soil. Quantity of vermicompost does not significantly affect the number of leaves (Table 5). More significant effect was observed in the systems of growing. Plants from seed bed form a larger number of leaves (from 3,98 to 4,28) than those in the modified floating system (from 2,50 to 2,60). Fresh weight of leaves was influenced of both factors — quantity of vermicompost and system of growing seedlings. Total fresh weight of seedlings is indicative sign of vermicompost effect on growth characteristics of plants (Picture 2). Vermicompost has a positive influence on this indicator than control. The plants from traditional seed bed respond very well of levels from 50 to 75% of substrate mixture as fresh weight reaches from 6,53 to 6,67 g, but remains less than mineral fertilization – 7,57 g. The plants of the modified floating system had a very good characteristics in substrate enriched with 25% vermicompost. The larger amount of the organic fertilizer has a depressing effect and plants have a lower fresh weight because they remain smaller in size. Vermicompost 50% of substrate mixture affected very well habit of plants from traditional seed bed: plant height 18,33 cm, stem fresh weight 3,47 g, diameter of stem 4,56 mm, 3,98 leaves with weight 2,51 g. Vermicompost 25% of substrate mixture affected very well habit of plants from modified floating system: plant height 4,94 cm, stem fresh weight 0,29 g, diameter of stem 2,69 mm, 2,60 leaves with weigh 0,38 g.
Quantity of organic fertilizer affected weight of roots. 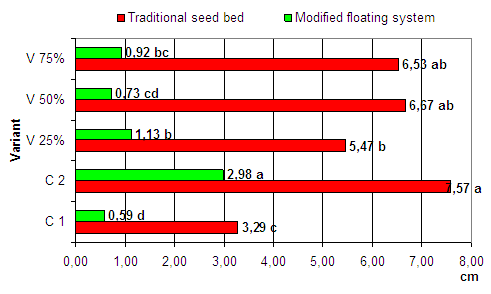 Plants from traditional seed bed exceed almost twice those of the modified floating system in this indicator. System of seedlings growing influenced habit of tomato plants and these from traditional seed bed have a more strong habit than those from modified floating system. Effects of dosage levels for vermicompost and system of growing of tomatoes seedlings were observed to establish optimal conditions for young plants. The experiments were carried out with tomato cv. Nikolina F1, in Maritsa VCRI, Plovdiv, Bulgaria, during period 2014-2015 years. Two systems - traditional seed bed and modified floating system in five treatments were used: Control 1 - without fertilizers; Control 2 – with mineral fertilizers; Vermicompost 25% of substrate mixture; Vermicompost 50 % of substrate mixture; Vermicompost 75% of substrate mixture. Vermicompost 50% of substrate affected very well habit of plants from traditional seed bed: plant height 18,33 cm, stem fresh weight 3,47 g, diameter of stem 4,56 mm, 3,98 leaves with weight 2,51 g. Vermicompost 25% of substrate affected very well habit of plants from modified floating system: plant height 4,94 cm, stem fresh weight 0,29 g, diameter of stem 2,69 mm, 2,60 leaves with weigh 0,38 g. Seedlings from traditional seed bed have a strong plant habit than those grown in modified floating system.